As we celebrate the 100th Anniversary of the Town of Chincoteague this year, it seemed appropriate to delve into the history of the original Town boundaries. These corporate limits set the area within which the ordinances passed by the Council applied and over which the Town held the right to tax the inhabitants; pretty important stuff if you want your pigs to roam free and the Town prohibits such wanderings. The present Town Charter describes the growth of the Town in four incremental steps, from the original lines set in 1908 to the present boundaries established in 1989. Today the Town encompasses the entire Island plus the surrounding waters, from Queen Sound Channel to the western shore of Assateague Island, from the Maryland-Virginia line to Chincoteague Inlet. Most maps of the area date from the 1930's and 1940's, and show the corporate limits as they were in 1942, when the Charter of the Town was rewritten. The problem, of course, is that the properties in the description have changed hands many times in the intervening century, and thus it is difficult to determine exactly where they were. The original southern* boundary was the northern property line of Ella Fish. Mary Ella (Boston) Fish (1876-1911) married David Fish in 1895. David died in 1900 and Ella married James D. Whealton (1863-1938) in 1909. The property in question is that of widow (in 1908) Ella Fish, and its northern boundary turns out to be the south side of what is today Boothe St. Two hundred yards east of Main St. ends the southern boundary at a line followed north by the Booth-Whealton Cemetery (lies between Main and Willow). This line then intersects the east-west Town line shown on all of the maps as lying just south of present-day Howard St. Admittedly a bit complicated, but now we know the original southern Town limits. So, if you lived in Ticktown (the southern half of Willow St.), your pigs could roam as they pleased. The west and east limits of the Town in 1908 were, respectively, Chincoteague Channel and the Glade (otherwise noted as the Canal). You can get a good idea of what (a tame version of) the Glade looked like by driving east from Main St. on Bunting Rd. to the bridge over the gut. Look north and south. On March 13, 1942, the General Assembly approved a revised Town Charter. In that document are listed two annexations to the Town, one to the south and the other to the north. (Listed as #1 and #2, respectively, in the Charter.) This document, however, raised two questions: was General Assembly approval required for annexation, and when in the intervening years since 1908 did these annexations occur? The answer to the first is found in the Acts of the Assembly. Prior to 1902, all modifications to corporate boundaries required Assembly approval. In 1902 the State Constitution was altered to allow changes to the annexation statutes. A moratorium on annexations existed for two years until, in 1904, the Assembly gave towns and involved counties the authority to enact corporate boundary changes. Annexation required consent of 51% of the voters in the affected area and equitable compensation of the county for any improvements they had made to the region. The town was required to provide services to its new residents and had the authority to levy taxes. A search of the town Council records and Circuit Court documents at the County Courthouse reveals the specifics of the two annexations. On May 22, 1926, two annexation petitions were presented to the Town Council. The first was under the name of K. J. Bunting and was signed by 44 of 75 registered voters in the proposed annex, which lay to the south of the original town. The second, under the name of A.J. Hill, was signed by 38 of 52 registered voters of the area, which lay north of the town. [The petitions, with all the original signatures, still exist.] On June 7, 1926 Mayor John W. Winder and Council Clerk C. F. Matthews signed resolutions, passed by unanimous vote of the Town Council, to recommend that the Circuit Court of Accomack County enter orders annexing both the southern and northern areas. Notice of the proposals appeared in the Peninsula Enterprise between May 22 and June 12, 1926. On June 15, the County Board of Supervisors signed a document supporting the annexations, and on June 22, 1926 the Accomack County Circuit Court, presided over by Judge N.B. Wescott and two judges appointed by the Governor, Harry F. Byrd, heard evidence presented by the affected parties, and found in favor of the annexations. In doing so, they substantially increased the size of the Town, expanding the population by roughly 50% and more than doubling the incorporated area. As an aside, on March 5, 1928 the town Council appointed John W. Winder and J. S Baker �to appear before the General Assembly on behalf of the annexation bill.� No reason is stated, no further mention is made of this overture, and no action of the Assembly is recorded. Since the official Charter contained a description of the Town boundaries, it is possible that the unfulfilled request was to modify the Charter to include the 1926 annexations. That addition, however, did not occur until the Charter was completely fully revised March 10, 1942. Adjacent to the original corporate limits, the annexes are easy to plot. The southern was a slight dogleg, roughly 200 yards wide, extending from just south of Beebe St. (in the words of the petition: �a point fifty (50) yards to the southwest of the southwest boundary of Fred Bowden's land �) to the original southern town line, plus the west side of lower Willow Street. On the north, the annex simply expanded the town northward to a line just south of the present high school parking lot (�along the center of a private roadway across the lands of the late Joshua W. Whealton, as it now exists, the same running between the dwelling houses of the late Joshua W. Whealton and the one now occupied by Sidney Daisey�), about 120 yards north of Daisey St. The accompanying modified 1964 USGS map shows the original Town boundaries (1908), and the southern (1) and northern (2) annexes. Old time Teaguers apparently felt no pressing need to have such a map. After all, everyone knew where Joshua Whealton, Fred Bowden and Ella Fish lived. So why would you need a map? Well, needed or not, we now have one. *Since the long axis of Chincoteague Island lies on a NE to SW line, directions involve complex �diagonal� points on the compass. Islanders have long since simplified the issue with the shorthand: Northeast = north (up the Island), Southeast = east, Southwest = south (down the Island), and Northwest = west. ** Population of the Town was 1418 in 1920 and 2301 in 1930, a 62.2% increase. Original area ~210 acres, southern annex ~119 acres, and northern annex 192 acres. Therefore, the area increased from ~210 acres to ~521 acres, or an increase of ~143.8%. The author is indebted to the assistance of Brent Hurdle, County Tax Assessor, Mayor Jack Tarr, and Karen Hipple in preparing this article. 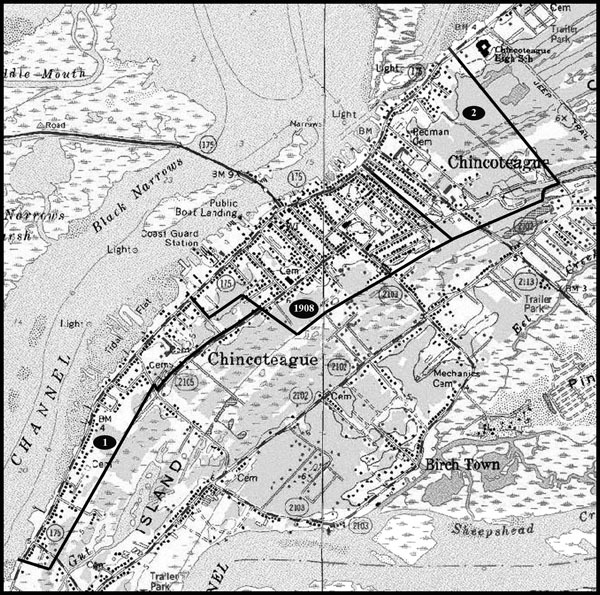 The following is a description of the Boundaries of the Town of Chincoteague that appeared in the 1942 revised Charter. 2nd. Beginning at the northwestern corner of the present boundary of the Town of Chincoteague, at low water mark, it being the dividing line between the lands owned by David Watson and Daniel Watson, thence running in a northeasterly direction along ordinary low water mark to a point opposite the land occupied by the late Joshua W. Whealton, thence in a southeasterly direction along the center of a private roadway across the lands of the late Joshua W. Whealton, as it now exists, the same running between the dwelling houses of the late Joshua W. Whealton and the one now occupied by Sidney Daisey in a straight direction across the Deep Hole County road to the canal; thence in a southwest direction along said canal to the corporate limits of the Town of Chincoteague, it being a point also that separates the land of David Watson and Daniel Watson, thence in a northwest direction following the northern boundary of the present Town of Chincoteague to low water mark, the point of beginning,-the above description being a verbatim description of the territory which was annexed to the Town of Chincoteague in the petition of A. J. Hill and others to annex territory, et cetera, to the Town of Chincoteague. 3rd. Beginning at a point on the centerline of State Route 175, said point being the intersection of the centerline of Route 175 east entering the Island and the present Corporate Limit. From this point in a northern direction along the Corporate Limit to the point of intersection with the northern right-of-way of Route 175 entering the Island. Thence westerly along the northern right-of-way of Route 175 approximately 12,000 feet to a point where the right-of-way crosses the center of Queen Sound Channel. Then following the center of Queen Sound Channel in a northwesterly direction approximately 2,500 feet to a point where the channel divides, from this point in a northeasterly direction across Chincoteague Bay to a point on the Virginia/ Maryland state line, said point being approximately 25,400 feet west of the intersection of the Virginia/Maryland state boundary and the mean low water line on the western side of Assateague Island. Then from said point in an easterly direction along the Virginia/Maryland state boundary, to a point being the intersection of the Virginia/Maryland state boundary and the westernmost mean low water line on Assateague Island. Then from said point in a southerly direction following the mean low water line to the western tip of Fishing Point the line crosses Chincoteague Inlet to a point being the westernmost point of the mean low water line on Chincoteague Point near Hammock Point Light. Then extending this line from said point in a northwesterly direction, approximately 3,000 feet to the middle of Queen Sound Channel, then from said point along the middle of Queen Sound Channel to its intersection with the southern right-of-way of Route 175. Then following the southern right-of-way eastward to its intersection with the present Corporate Limit, then from this point northward along the Corporate Limit to the point of beginning. It is the purpose of the three above descriptions to include all lands within the present boundaries of said town according to the Charter of said town and the annexation proceedings of Kendall J. Bunting and others and the annexation proceedings of A. J. Hill and others as found among the records in the clerk's office of the circuit court for the County of Accomack, Virginia.